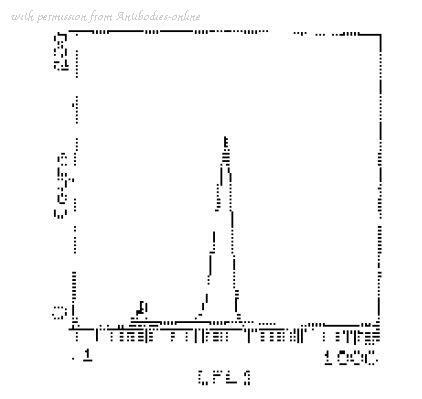 Figure A. RPE conjugated rat anti mouse CD4 ( MCA2691PE ). 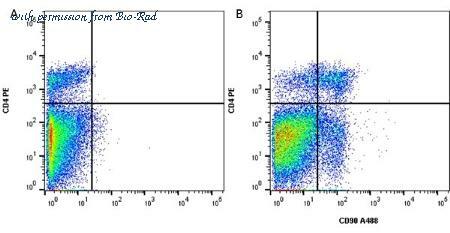 Figure B. RPE conjugated rat anti mouse CD4 ( MCA2691PE ) and A488 conjugated mouse anti mouse CD90 ( MCA02A488 ). 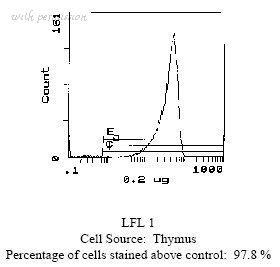 All experiments performed on red cell lysed murine splenocytes gated on mononuclear cells. Data acquired on the ZE5 cell analyzer. 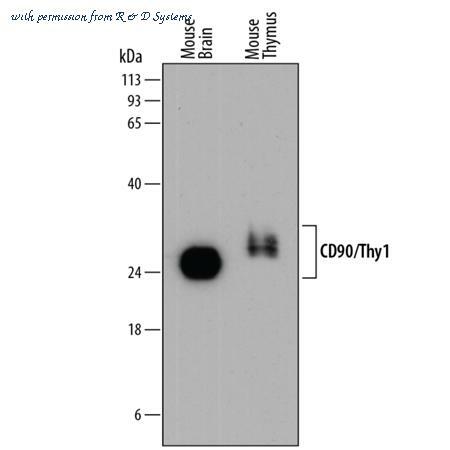 Detection of Mouse CD90/Thy1 by Western Blot. Western blot shows lysates of mouse thymus tissue, mouse brain tissue, EL-4 mouse lymphoblast cell line, and CTLL-2 mouse cytotoxic T cell line. PVDF membrane was probed with 0.2 ╡g/mL of Sheep Anti-Mouse CD90/Thy1 Antigen Affinity-purified Polyclonal Antibody (Catalog # AF7335) followed by HRP-conjugated Anti-Sheep IgG Secondary Antibody (Catalog # HAF016 ). A specific band was detected for CD90/Thy1 at approximately 25-35 kDa (as indicated). This experiment was conducted under reducing conditions and using Immunoblot Buffer Group 1 . 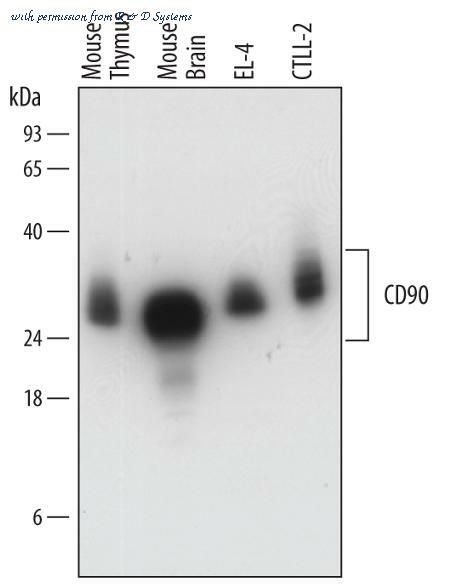 Detection of Mouse CD90/Thy1 by Western Blot. Western blot shows lysates of mouse brain tissue and mouse thymus tissue. PVDF membrane was probed with 0.5 ╡g/mL of Rat Anti-Mouse CD90/Thy1 Monoclonal Antibody (Catalog # MAB7335) followed by HRP-conjugated Anti-Rat IgG Secondary Antibody (Catalog # HAF005 ). Specific bands were detected for CD90/Thy1 at approximately 25-30 kDa (as indicated). This experiment was conducted under reducing conditions and using Immunoblot Buffer Group 1 . 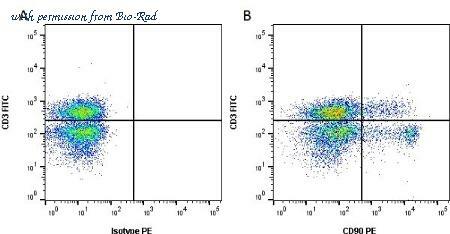 Detection of CD90/Thy1 in Mouse Splenocytes by Flow Cytometry. Mouse splenocytes were stained with Rat Anti-Mouse CD3 PE-conjugated Monoclonal Antibody (Catalog # FAB4841P ) and either (A) Rat Anti-Mouse CD90/Thy1 Alexa Fluor« 647-conjugated Monoclonal Antibody (Catalog # FAB7335R) or (B) Rat IgG2A Alexa Fluor 647 Isotype Control (Catalog # IC006R ). View our protocol for Staining Membrane-associated Proteins . 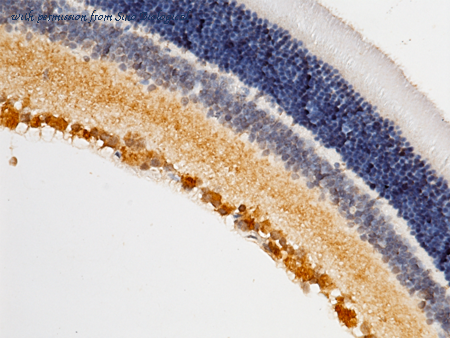 Immunochemical staining of mouse THY1 in rat retina with rabbit polyclonal antibody (0.5 µg/mL, formalin-fixed paraffin embedded sections). 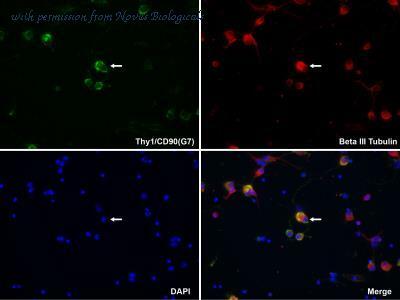 Positive staining was localized to ganglion cells. 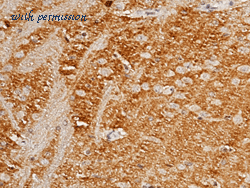 Immunochemical staining of mouse THY1 in rat brain with rabbit polyclonal antibody (0.5 µg/mL, formalin-fixed paraffin embedded sections). 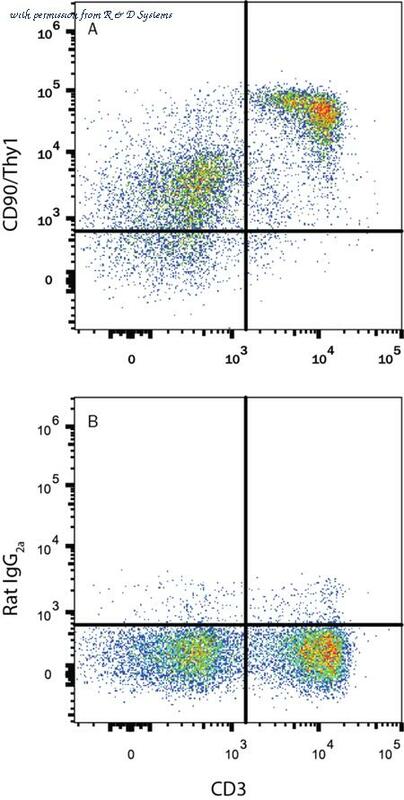 Flow Cytometry: CD90/Thy1 Antibody (G7) [NBP1-28031] - Flow Cytometry: CD90/Thy1 Antibody (G7) [Biotin] [NBP1-28033] - BALB/c mouse splenocytes were stained with Rat Anti-Mouse CD90-BIOT and Rat Anti-Mouse CD3 epsilon-PE followed by Streptavidin-FITC. Image using the Biotin form of this antibody.